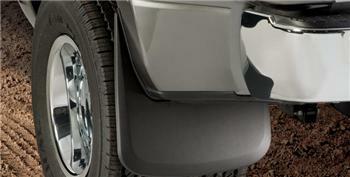 Husky Liners Mud Guards - Custom Molded - Dezod Motorsports Inc - Home of the automotive performance enthusiast since 2002. Custom Molded Mud Guards offer excellent protection for your vehicle’s exterior doors and quarter panels as well as the vehicles around you. Husky Custom Molded Mud Guards are developed using the latest in design technology to contour and form fit your specific vehicle’s exterior fenders. These mud flaps for trucks are also designed for full tire tread coverage and maximum length helping to prevent damage to your vehicle while keeping your running boards clean and minimizing flying road debris. Husky Mud Guards include all the necessary fasteners and instructions for a quick and easy installation. Manufactured from a highly durable impact resistant thermoplastic, these mud guards will endure extreme weather conditions for the life of your vehicle. A black textured finish and sleek contoured design provides enhanced styling for a factory look. Husky Liners® brand Custom Molded Mud Guards provide tough protection with style for virtually all of today’s popular trucks, cross-overs, and sport utilities.